This treasure trove of cutaway views of 1940s aircraft features art from the top magazines of the era: Aeroplane, Flight, Aviation, L'Aeronautique, and others. The majority of the illustrations are American models, described with extensive notes and explanations. Select British and German planes are featured as well. The two-part treatment begins with a look at individual components: wings, empennage, controls, fuselage, landing gear, interior elements, and armament. The second part focuses on complete aircraft, depicting military and commercial single-, twin-, and multi-engine planes. Formed in 1912, Lockheed Aircraft Corporation was a leading WWII aircraft manufacturer and was responsible for the only plane in production throughout the entire war, the P-38 Lightning. 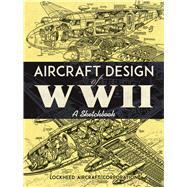 Lockheed's Chief Engineer, Hall L. Hibbard, states the book's intention in the Preface: "to give the designer a collection of ideas, in sketch form, that will stimulate his own creative and inventive mind." Model builders, vintage aircraft enthusiasts, and any creative person with an interest in the field will find this volume a valuable resource. Formed in 1912, Lockheed Aircraft Corporation was a leading WWII aircraft manufacturer and responsible for the only plane produced throughout the entire war, the P-38 Lightning. Chief Engineer Hall L. Hibbard states the book's intention in the Preface, "to give the designer a collection of ideas, in sketch form, that will stimulate his own creative and inventive mind."